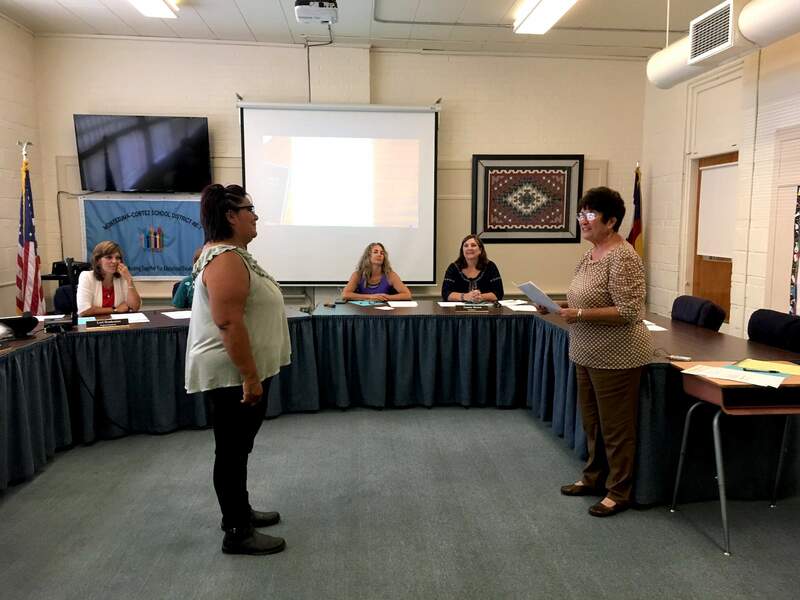 Regina Lopez-Whiteskunk, left, is sworn in as the District D director on the Montezuma-Cortez Board of Education. On Tuesday, the Montezuma-Cortez RE-1 school board said farewell to one director and welcomed another. In a brief morning meeting, the board voted to accept the resignation of District A Director Brian Balfour, who cited family responsibilities and a new post in the Church of Jesus Christ of Latter-day Saints as his reasons for leaving. They also voted unanimously to appoint Regina Lopez-Whiteskunk as the new District D director, filling a seat left vacant several months ago by Josiah Forkner’s resignation in April. The school district will begin advertising right away for a new District A director. The remaining board members said they understood Balfour’s reasons for leaving, but that he would be missed. “He brought a great balance to the board,” said Director Sheri Noyes. After accepting Balfour’s resignation, the board voted to begin advertising his position immediately and schedule candidate interviews for the Sept. 18 meeting. The deadline for applications will be Sept. 14. 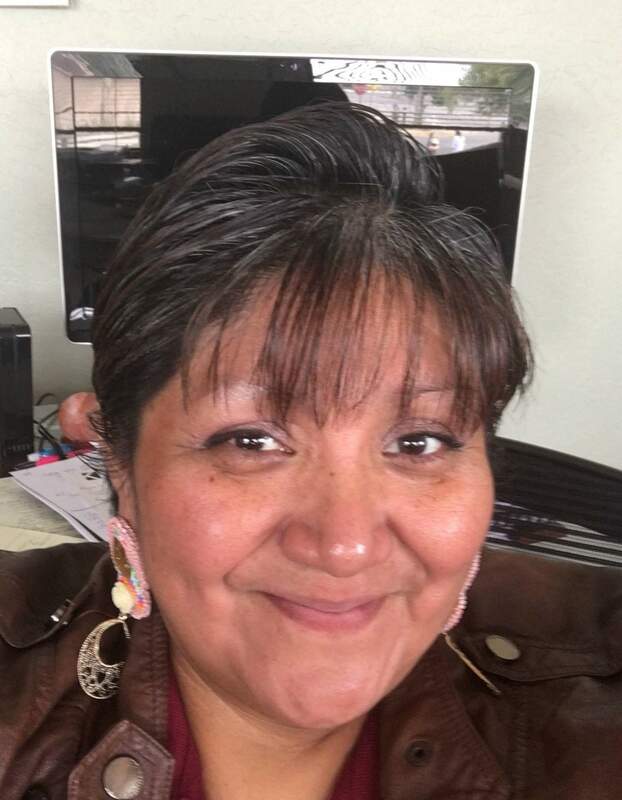 Lopez-Whiteskunk, a former Ute Mountain Ute Tribal Council member, was appointed the new director for District D, which includes Towaoc and the part of the reservation that lies in Colorado. She filled the seat left by Forkner, who was elected unopposed in November 2017. She’ll finish his two-year term, and be eligible to run for re-election in 2019. Board president Sherri Wright said the directors were impressed by Lopez-Whiteskunk’s interview and references. “We’re very, very excited to have her as a representative and a great asset to Towaoc,” Wright told the audience at the meeting. Lopez-Whiteskunk’s first action on the board was to take part in a lengthy workshop in which board members discussed the district’s proposed mill levy override. After a ballot question that would have increased the mill levy was defeated in the November 2017 election, the district has been spending the summer researching strategies to make its next attempt more successful. On Tuesday, district staff discussed possible changes to the ballot question, which is designed to increase salaries for teachers and fund new equipment and buses, among other things. One such change could be the inclusion of a sunset date for the increase. Board members were divided on that issue, with some saying it would make the ballot question more appealing to voters, and others saying it could cause problems for the district when the money ran out. Other possible changes that came up during discussion included the addition of an oversight committee to supervise the district’s use of the extra revenue, or a clause specifying that the mill levy increase would end with the passage of Initiative 93, a proposed tax increase benefiting Colorado schools that is currently making its way through the Colorado Legislature. The board didn’t make a final decision about the ballot question in the workshop, but the directors agreed on the need to choose its wording quickly if the district is to advertise it ahead of this year’s election. Superintendent Lori Haukeness said the board will discuss whether to move forward with the ballot question at its next meeting, scheduled for Aug. 7.